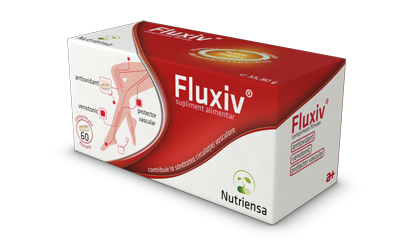 Fluxiv® is a combination of three bioflavonoids, substances with multiple benefits for the human body – diosmin, hesperidin, troxerutin and vitamin C. All these ingredients work synergistically and have a mutually empowering action, with greater effectiveness in maintaining healthy veins and capillaries. The normal functioning of the venous system requires a healthy lifestyle, with regular physical activity and a balanced diet. Venous insufficiency is a condition in which the normal flow of blood through the veins is impaired. Given the lifestyle, genetic (hereditary factors, environmental and occupational factors, etc., 32% of the Romanian population suffers from chronic venous insufficiency. * according to the “Lower limb chronic venous insufficiency treatment guide” published on the Ministry of Health website. Fluxiv® is a food supplement recommended for improving the quality of life of people who experience discomfort determined by a deficiency of the venous system in the legs or hemorrhoidal veins. Fluxiv® is administered orally, one tablet two times a day for 2 months. The treatment can be repeated after a month. Fluxiv® is a food supplement produced by Antibiotice. Food supplements should not replace a varied and balanced diet. Read the leaflet before use.